U.S. President Donald Trump has just been jaw-boning China again, threating 25% tariffs. China has said it would retaliate. We have seen some impact already from trade flows that boosted U.S. Q2 GDP as soybeans were pushed out the door in great haste ahead of expected agricultural tariffs abroad. But so very, very, little trade was actually impacted by tariffs in July. However, there is still an environment of threats and plenty of uncertainty here to adversely hit trade values and that is apparently what we are seeing as the manufacturing PMI data are imploding in July. The U.S. has been considering that 25% tariff on $200 billions of Chinese goods and Trump is repeating that threat and suggesting it could be expanded. Meanwhile, the global trading system seems to be affected. International trade is mostly about goods. Services are traded and the amounts have grown, but goods are the center of attention here. So the widespread and ongoing declines in manufacturing indexes are not a good development and probably reflect fallout from a cautious business approach over trade. 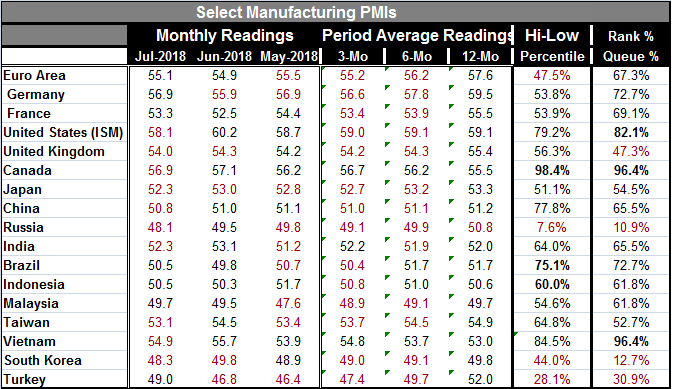 Of the 17 countries in the table, ten have lower manufacturing PMIs in July. Fourteen of 17 have lower PMIs on balance over three months compared to six months. Six-month average PMI levels are lower than 12-month levels in all countries in the table except Vietnam, Indonesia, Brazil and Canada. China is not very far above the no-growth line as its PMI slipped in July from an already weakened position. Russia and Turkey are already showing contraction along with South Korea and Malaysia. These are too many important countries that are experiencing manufacturing contraction for us to be dismissive about the growing risk to growth. The United States, Canada and Vietnam are the only 80th and 90th percentile queue standings in the table. Additionally, only Brazil and Germany have 70th percentile decile standings. Six others have moderately firm 60th percentile standings. But Russia, Turkey and South Korea (countries we already have referred to as weak) have extremely weak queue percentile standings. In addition to them, the United Kingdom is now below its 50th percentile queue standing although the level of its manufacturing PMI is still solid. And apart from trade, there is an economic cycle to deal with. Having adverse impacts from this sort of external shock simply makes policymaking more difficult. India, for example, with a very moderate manufacturing PMI ranking, hiked rates on Wednesday, bringing its repo rate higher by 25bp. China is experiencing a sharp weakening in its currency, the yuan. It fell by 8% in July, marking the fourth largest monthly drop on record. This weakening runs counter to the U.S. threats to disrupt trade. A weaker yuan makes Chinese goods more competitive and at this rate of slippage the threatened Trump tariffs will be whittled away to nothing in no time. It is uncharacteristic for China to let its currency weaken so much so quickly so we can assume that China’s ‘neglect’ is part of a program to undercut U.S. trade tactics. Fortunately, the U.S. and China are trying to talk things out. But at the same time, some bitter exchanges continue, leaving a great sense of uncertainty about what happens next – not to mention anxiety about what is happening now. The U.S. and the EU already have an agreement to negotiate instead of escalate. But the U.S. is saber rattling over NAFTA and that one does not seem to want to go away. Through all of this, the U.S. economy continues to perform well. The U.S. ISM manufacturing PMI has oscillated between 58.1 and 60.8 for 11 of the past 12 months. In Today’s release, the barometer fell to 58.1 in July from 60.2 in June. These are very strong readings. But just because the U.S. economy is feeling no pain right now, it does not mean it will escape a trade war unscathed. It won’t.